The heavy international focus on prosecutions for war-time human rights abuses in Sri Lanka is a reductive view, often shutting down discussion as opinions become divisive. On the one hand, calls for prosecution come with the demand to have international judges, to ensure a credible process that addresses the deterioration of the criminal justice system. On the other hand, prosecution is often said to betray “war heroes” and international participation to undermine sovereignty. Even as post-war communities strive to come to terms with the aftermath of war while struggling against neoliberal development policies imposed on them, solutions proposed by international heavyweights frequently override the concerns of the affected people. Following regime change in 2015, Sri Lanka is moving on major reforms this year. The government claims it is addressing the aspirations of its citizens, including the most war-affected people, through a constitutional political solution, a robust transitional justice process and far-reaching economic development. Yet, the lived realities and the struggles of the people may well contradict the work of the experts putting forward these reforms. The northern and eastern regions, repressed for decades by war and post-war militarization, saw a plurality of democratic voices emerge early this year, as people gathered in large numbers to the District Secretariats to present their ideas for the new constitution. They articulated issues rarely discussed in the media, such as caste, gender, customary law and innovative institutional structures, through the lens of everyday life and events. What will become of these submissions, however, remains in question. Since the end of the war in 2009, the government under former president Mahinda Rajapaksa held several consultations and inquiries into various aspects of war, truth and compensation. Though these processes were heavily criticized for falling short of credible procedures, affected persons gathered in the thousands to express their concerns. For instance, most people who came before the Presidential Commission to Investigate into Complaints Regarding Missing Persons, sought truth and the whereabouts of their family members. Their tears of loss could not be separated from their stories of day-to-day struggle for income and stability. For the families of the disappeared, socio-economic challenges and finding their missing go hand in hand. 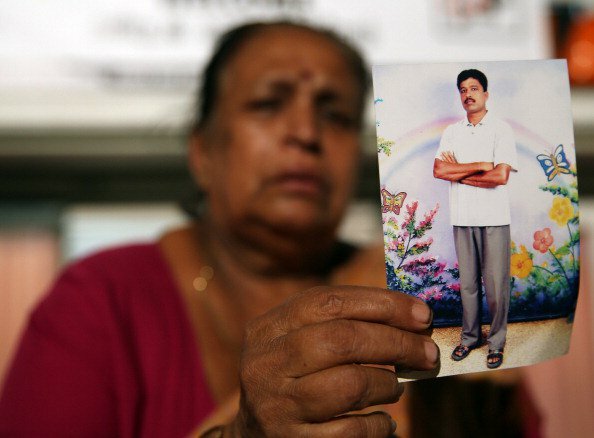 A Tamil woman holds up a photo of her son, who disappeared near the end of the Sri Lankan civil war. However, government officials and many of the mobilizing organizations often direct the families to choose between economic assistance and finding the truth. For example, during hearings, the Presidential Commission would interrupt with questions about livelihood assistance while the testifier struggled to remember specific details of an incident relating to a disappearance many years back. Questions such as: “Do you want a death certificate?” and “Have you received compensation?” often led to angry, tearful retorts from the families of the disappeared. On the other hand, families of the disappeared have been forced to boycott Commission sittings and instead participate in demonstrations. On one such protest, placards read “We ask for our relatives, you give us goats and chicken”. Some families of the missing had to evade the organizers of that protest in order to testify before the Commission. This forced compartmentalisation of truth and socio-economic concerns is also present in the transitional justice discourse in Sri Lanka today, which claims to consist of the four pillars of truth, justice, reparation and non-recurrence. But in practise, its predominant thrust has been to prioritize war crime prosecutions—heavily influenced by international actors—at the cost of addressing continuing economic inequalities and exploitation. The newly launched Consultation Task Force on Transitional Justice has the formidable challenge of prioritizing the concerns of the war-affected people and neutralizing the powerful agendas of international human rights experts and political organizations. Even as the new government promises to improve on human rights, it is also pushing for economic reforms that will further dispossess the people.Even as the new government promises to improve on human rights and create an inclusive constitution, it is also pushing for economic reforms that will further dispossess the people. While parts of the country’s Sinhala dominated South have a history of resisting neoliberal economic policies, the Tamil-dominated North has seen the emergence of major protests this year. An Asian Development Bank project under assessment to supply desalinated water to Jaffna Town, from the Vadamaratchy East coast, met with one of the most well-mobilized protests in the post-war North. Protestors felt the project could undermine the fishing livelihoods of the local community. In a USAID-subsidized MAS Holdings factory, the largest apparel plant in the North, garment workers went on an unprecedented spontaneous strike against harsh labour conditions. These protests are signs of the new democratic assertions in the war-torn regions, but they also reflect the contradictions between the aspirations of the people and the policies of the government. Today in Sri Lanka, processes of reform are overwhelmingly influenced by international knowledge industries in transitional justice and comparative constitutional making. Indeed, with the new dispensation towards reform, there has been a proliferation of international workshops targeting Sri Lankan opinion makers in NGOs and the government. These international discourses and many of the local experts are either oblivious to or seek to override people’s voices. But how long can human rights experts ignore the repeated socio-economic concerns that citizens are raising in the consultative processes? Furthermore, these experts are often silent about mega development policies, which exclude rather than reconcile the war-torn communities. The recent controversy over the 65,000 prefabricated steel houses proposed by the Government for the war-affected regions is case in point. Placing the interest of a multinational company Arcelor Mittal—which is looking for a dumping ground for its steel products—over the legitimate housing needs of the people would be an inerasable blot on any reconciliation efforts by the Government. Local activists are openly opposing this contracted project, worth an estimated one billion US dollars. They are demanding community-driven housing construction with local labour and resources that can build community resilience. However, many other actors who otherwise tout good governance, human rights and transitional justice have said little in public about this ill-conceived project. The international agendas of transitional justice and liberal constitutionalism can move dangerously close to neoliberal dispossession when socio-economic grievances are ignored. In this context, the long-suffering people engage at every opportunity they get, through vibrant protests, silent demonstrations, and even government mechanisms. And it is the increasingly audible democratic voices of the people throughout the country, and the new solidarities they form, that can correct the course of the constitutional and transitional justice processes.